RO U N D YE A R O PE N A family friendly RV resort now open in Down East Carteret County. Fish, kayak, and swim right from the dock. A swimming pool, bathhouse, and boat ramp are just a few of the amenities offered. Waterfront and wooded campsites along with deep water boat slips are available to rent nightly, weekly, monthly, or annually. Come see what the Down East lifestyle is all about! Bringing You to the Beach Since 1990! 201 N. 17th St. Morehead City, NC 28557 Phone: 252-247-7442 Email: editor@nccoast.com Entire contents, maps, advertisements and graphic design elements copyright 2019 NCCOAST. Reproduction is strictly prohibited without the publisherâ&#x20AC;&#x2122;s consent. Though every effort has been made to ensure the accuracy of all advertising and editorial copy contained herein, the publisher may not be held responsible for typographical errors. NCCOAST and its employees, agents or representatives may not be held responsible for any actions or consequences derived as a result of following advice or instructions contained herein. NCCOAST reserves the right to refuse any advertising or editorial content deemed inappropriate, misleading or in violation of the law. THE Beach From Atlantic Beach, the oldest of the five beach towns that dot Bogue Banks, to Emerald Isle, the largest, visitors find mile after mile of sun, sand and surf. The collection of communities feature a variety of accommodations, restaurants and shopping. The area, while limited in full-time population, swells each summer as second home owners and vacationers make the trek to the shore. BIKES & BLOOMS: Make sure to take a drive through Emerald Isle on Saturday and Sunday, May 4 & 5. To welcome the annual Bike the Banks event, the local garden club organizes Bikes & Blooms, which encourages businesses and residents to add a little color to their exterior with bicycle-themed floral arrangements. LIVING HISTORY: People often remember their history classes as boring and dry. Fort Macon State Park will change some of that Saturday and Sunday, April 27-28 with its popular Living History Weekend reenactments. The First NC Volunteers/11th NC Regiment and other reenactment groups will portray troops from the Civil War era from 10am-4pm each day, offering visitors a glimpse back in time. BEACH RUNS BEGIN: Carteret County Parks and Recreationâ&#x20AC;&#x2122;s popular Beach Run Series hits the beach for the first two races of the season May 9 and 23. Each run includes a 1-mile, 5K and 10K route. Walkers are welcome in the 1-mile and 5K. Additional races will be held June 6 & 20, July 23 and Aug. 6 & 20. Learn more at ccpr.recdesk.com/ recdeskportal. SUMMER BEAT: On Saturday, May 18, music lovers with have a chance to enjoy the sounds of popular beach music with their toes in the sand. The Atlantic Beach Beach Music Festival brings classic shagging music to the shoreline. From 11am to 6pm, the beach will fill with beach music enthusiasts to watch Jim Quick & Coastline, Fantastic Shakers, Band of Oz and the Mighty Saints of Soul perform. Weâ&#x20AC;&#x2122;re acting up on the Crystal Coast! Oklahoma! National Seashore to view, and climb, and lighthouse, a landmark since 1859. On. On Shackleford Banks, history may wander past you in the form of the Shackleford Banks wild horses. The Light Station Visitor Center, found near the lighthouse ferry dock, houses exhibits on lighthouse history and early shipwrecks and rescues. The seashore’s main visitor center is located on Harkers Island, which houses additional exhibits. An indoor theater offers a short film and a nature trail winds along the shore to an observation deck overlooking Core Sound. Public restrooms and a nearby picnic area are available and wheelchair accessible. For more information call 252-728-2250 or visit www.nps.gov/calo. All visitors should remember this is a remote, natural territory with no food vendors, limited fresh water access and no lifeguards. Be prepared to bring in everything you may need during your visit and carry out all that bring in. Ferry Schedule Call 1-800-BY-FERRY or visit www.ncferry.org for updated information and rates. See ncferry.org for additional ferry schedules for the Currituck-Knotts Island ferry and Southport-Fort Fisher ferry. Name of driver & type of vehicle are required when making reservations. Can call up to 90 days in advance. Knowing the beach is our BUSINESS. Helping you find your place at the beach is OUR PLEASURE. Show returns May 18-19. The downtown Morehead City area sets a perfect backdrop, providing restaurants, bars and shops to visit after the show. “We are so excited to present to the community a variety of events throughout the weekend, all celebrating some of the most vital industries to our Morehead City community,” said Lisa Rueh, executive director with Downtown Morehead City, Inc. “This event wouldn’t be possible without our wonderful partners and sponsors. We welcome the community to come and see the largest in-water salt water boat show in Eastern North Carolina and invite them to enjoy all that downtown Morehead City has to offer.” The Crystal Coast Boat Show features both new and used boats, in-water and on land, showcases a variety of marine products and services, outdoor gear, fishing tackle, brokers and resource conservation groups. The boat show is free and open from 9am-5pm on Saturday, May 18 and 9am-4pm on Sunday, May 19. For more information, visit www.crystalcoastboatshow.com. Be sure to follow along on facebook and Instagram. ALLOW US TO ASSIST YOU IN PLANNING YOUR NEXT BEACH VACATION! THE MAINLAND From Cape Carteret on the shores of the White Oak River to the downtown Morehead City waterfront, the small communities that dot the Carteret County mainland are as eclectic as their residents. As the retail hub of the region, centrallylocated Morehead City is a haven for shoppers with its small boutiques and major chain stores. But don’t overlook the smaller communities as each has a flavor all its own and plenty of treasures to explore. PIG COOKING IN NEWPORT: Planned for April 5-6 at Community Park, the Newport Pig Cookin’ Contest will draw thousands with its amusement rides, live entertainment, vendors and abundance of Carolina barbecue. About 70 hogs are cooked annually by teams from around the country all vying for top honors. Things kick off with a parade on Friday evening and the chefs quickly get to work. Judging takes place Saturday morning and barbecue plates go on sale around 11am. To learn more visit www.newportpigcooking.com. MAGICAL HISTORY TOUR: On April 12-13 the New Bern Historical Society invites everyone to celebrate New Bern’s extraordinary heritage and beauty with an exciting new homes tour featuring some of the finest properties in five historic neighborhoods. Visitors will be invited to tour 18 historic properties over the two days: 15 homes, including two with renovations in progress, one public building and three gardens. Tickets are $20 in advance, $25 the day of the tour and can be purchased online at www.newbernhistorical.org/tickets. Everything for the Bird Enthusiast! Pick up a magazine from the comfort of your own home. BEAUFORT & DOWN EAST While Beaufort offers a beautiful walking waterfront, the picturesque Down East communities of Carteret County, many of which are part of a Scenic Byway, provide a great opportunity for a car trip. Beaufort (pronounced “Bō-furt”), is well deserving of its “America’s Coolest Small Town” title bestowed in 2012 by Budget Travel, with its eclectic blend of history and the contemporary amenities we have all grown to appreciate. CHECK YOUR SKILLS: The Fort Macon Power Squadron will offer its Boating Skills Virtual Trainer (BSVT) during the annual Wooden Boat Show, Beaufort. Visitors will be guided by LED screens showing a lake and has an actual Mercury outboard throttle, trim controls and steering wheel. The trainer will be available in the NC Maritime Museum library from 10am4pm on Friday, May 3 and Saturday May 4 and from 1-4pm on Sunday, May 5. ROCKING IN BEAUFORT: The Beaufort Music Festival, now 31 years young, provides the entertainment in Beaufort May 17 & 18 at the NC Maritime Museum’s Gallants Channel property off of Highway 70 near the new high rise bridge. It’s a new location for the free, family-friendly festival, and one that allows for much more room to grow. Performers include Hiss Golden Messenger, No BS! Brass, Aaron Lee Tasjan, Lilly Hiatt, Stop Light Observations, The Artisanals, Kamara Thomas plus others! 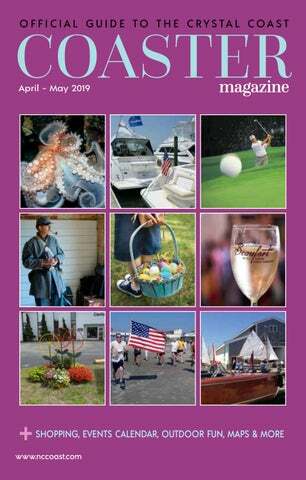 PUBLICK DAY IN HISTORIC BEAUFORT: On Saturday, April 13, the Beaufort Historic Site kicks off the spring season with Publick Day, an open-air market featuring a variety of artisans. Visitors can expect to find wood crafts, hand-made jewelry, baskets and pottery among other things. In addition, the Master Gardeners will hold a plant sale just in time for spring planting. Must present coupon at time of purchase. One coupon per person. Cannot be combined with any other offer. Some exceptions apply. Excludes recreation activities. urday, April 13 with its Art Unveiling & Wine Dinner. Held in the NC Maritime Museum’s Harvey W. Smith Watercraft Center, the event will highlight the signature painting donated to BWF by featured artist Susan Hecht. The painting will be used on promotional material and sold as a limited edition fine art poster during festival week. French Chef Pascal Coulon, a Michelin chef, will partner with chefs from Carteret Community College’s Escoffier program to prepare an unforgettable meal for guests. Proceeds from the event will go toward BWF’s next large scale community project; funding $100,000 of the new, state-of-the-art culinary and hospitality building on the Carteret Community College campus. Dressy casual attire is suggested. General tickets are $100 per person. For more information, email: beaufortwineandfood@gmail.com or call 252-5150708. Proceeds from events go towards Beaufort Wine & Food’s mission to support local charities and nonprofit organizations that strive to improve life in Carteret County. Since its first festival in 2004, BWF has donated over $730,000. Proceeds from this year’s festival will benefit the group’s next major community project – a $100,000 donation toward the construction of the new, state of the art culinary building on the campus of Carteret Community College. This new facility will more than triple the number of students served in the culinary, baking and pastry and hospitality programs. BWF has also pledged $50,000 to the Salvation Army for the construction of a commercial grade kitchen in the new building located in Morehead City. For more information on the upcoming festival or membership – which provides a discount to Wine & Food events – call office at 252-515-0708 or email beaufortwineandfood@gmail.com. Additional event information can also be found at www.beaufortwineandfood.org. All guests must be 21 or older to attend any Beaufort Wine and Food events, no exceptions. Pets are not allowed at any Beaufort Wine and Food events. Sites to See There’s more to living at the beach than dips in the oceans and offshore fishing. OK, so those things are really great. But there are loads of options in Eastern North Carolina when you get tired of feeling the warmth of the sand between your toes. Surrounded by museums, aquariums, historic sites and landmarks, there is so much to do beyond the beach that we could keep you busy every weekend for a year. The trials and tribulations of North Carolina’s third oldest town are preserved and remembered through the nearly 60-year-old Beaufort Historical Association and its accompanying site. With restored buildings and a variety of annual programs, the BHA transports visitors back to the first days of “Fish Towne.” Learn more at www.beauforthistoricsite.org. The 56-mile of Cape Lookout National Seashore is home to some of the most natural undeveloped stretches of beach to be found in the United States today. The three barrier islands that make up the park are only accessible by private boat or water ferry, so getting there may require a little planning as well as reservations during the busy summer months. But it’s well worth the journey. Find info at www.nps.gov/calo. land, this clearinghouse of Down East heritage is a must stop for anyone curious about this culturally-rich rural region. Once dependent on the water that surrounds it, Down East families entwined with boat building, decoy carving, hunting and fishing – a story that is told through community exhibits, artifacts and special programs. Details: 252728-1500, www.coresound.com. Morehead City’s only museum focuses on the rich, abundant history of this waterfront area. Visit an early school room, peek in to Carteret County’s fishing industry and touch the wheels of spy Emeline Pigott’s carriage. The Jack Spencer Goodwin Library, lauded for its genealogy materials, is available for public research. Details: 252-247-7533, www.thehistoryplace. org. From the Mountains to the Sea, the NC Aquarium at Pine Knoll Shores explores the wildlife of North Carolina’s waterways with a focus on preservation of the state’s delicate ecosystems. One of the highlights, the 306,000-gallon Living Shipwreck, features sand tiger sharks, sea turtles and hundreds of fish gliding around a three-quarter-scale replica of a German U-boat found off the coast. Details: 252-247-4003, www.ncaquariums.com. One of three maritime museums in the state system, the flagship in Beaufort tells the tale of Eastern North Carolina’s long-standing relationship with the ocean. Museum staff members have been involved with the preservation of artifacts excavated from the Queen Anne’s Revenge, Blackbeard the Pirate’s vessel that was lost just outside Beaufort inlet. For more info, visit www. ncmaritimemuseumbeaufort.com. Ready for a hike? Get back to nature with the Croatan National Forest, with its collection of hiking trails, boat launches, campgrounds and day-use areas. The Croatan is home to a large number of carnivorous plants native to the area, including the Venus flytrap. Headquarters is located at 141 East Fisher Ave., just outside of New Bern. Visit www.fs.usda. gov. TRYON PALACE This regal centerpiece to New Bern’s historic districts is a reproduction of the mansion constructed in 1770 for Colonial Governor William Tryon, who, after spending just a year in the home, fled North Carolina to become governor of New York. The original home was destroyed by fire in 1798. Site includes the NC History Center, a state-of-the-art museum, theater and meeting space. Learn more at www.tryonpalace.org. Trace the steps of the first chartered fire brigade, the Atlantic Hook & Ladder Company, and its competitors, the New Bern Steam Fire Engine Company No. 1. Established in 1955, the museum is currently raising funds to restore the Central Fire Station on Broad Street to its 1928 appearance, with hopes of relocating into the space. Details: 252-636-4087, www.newbernfiremuseum.com. 29 An 76 nS Fr 73 75 t. on t S 77 t.
Fishing the Coast The warm waters of the Gulf Stream provide the Crystal Coast with the longest fishing season on the Atlantic coast. The area is home to one of the largest fishing tournaments in the world for blue marlin; other fish caught along the Crystal Coast include bluefin tuna, yellowfin tuna, red drum, false albacore, sea trout, striped bass, cobia, sailfish, dolphin and wahoo depending on seasons. Many species, including drum and flounder, are caught surf fishing. Saltwater and freshwater anglers age 16 and older must have a valid, state-issued recreational fishing license to take fish in North Carolina throughout the year. Specific regulations and restrictions apply including size and daily limits. North Carolina offers a variety of fishing licenses from temporary to lifetime. Licenses for recreational fishing can be purchased online at www.ncwildlife.org, by visiting the Div. of Marine Fisheries in Morehead City or through area fishing supply stores. MUNICIPAL PARK IN MOREHEAD CITY, 3407 Arendell St.; several launching areas to the Intracoastal Waterway and parking for 33 boat trailers with additional parking at Marine Fisheries. MOONLIGHT DRIVE, Atlantic Beach Causeway; access ramp with minimal parking. EMERALD ISLE, 6800 Emerald Drive; handicapped accessible, has canoe access, restrooms and space for 112 boat trailers and 19 single-vehicle spaces. CEDAR POINT, 144 Cedar Point Blvd. ; ramp access is handicapped accessible, has canoe access, fishing pier, 37 boat trailer spaces and 7 single-vehicle spots. NEWPORT RIVER, 333 E. Chatham St., Newport; boat ramp with nine spaces for boat trailers, handicap accessible with one parking space and a ramp to the dock, canal is shallow and not conducive to larger vessels. OCEANANA FISHING PIER, NC Hwy 58, Mile Marker 1; connected to the Oceanana Family Resort Motel in Atlantic Beach, this is a well-lit fishing pier carrying a blanket fishing license, so anglers are not required to have one. Equipment rentals are available. Onsite facilities include a bait and tackle shop with snack bar with grill and ample parking. For more information, visit www. oceanana.com. BOGUE INLET PIER, Hwy 58, Mile Marker 19; a 1,000-foot lighted wooden fishing pier with ample parking and access to the Emerald Isle beach. The Bogue Inlet Pier offers bathroom facilities, multiple fish cleaning stations, bait, tackle and snack bar on the premises. For more information, visit www.bogueinletpier.com. RADIO ISLAND PIER, located at the base of the Morehead City-Beaufort Highrise Bridge, the 618foot fishing pier is free and open daily. The program will feature educators, biologists, environmentalists and historians giving presentations regarding whales and whaling that are appropriate for all audiences. There will also be displays showcasing marine mammal bones, teeth, baleen, oils and skeletons. “We like putting things in people’s hands when we can,” Rittmaster said. The program starts each year with his presentation. For those who have attended previously, he said he’ll have new photos and new information about some of the 34 species of whales currently found off the coast of North Carolina. “That’s more than any other state in the country,” Rittmaster said. “North Carolina has high diversity.” He’ll also provide an update on the endangered right whale. So far this year, there have been three births reported and it’s still calving season — a welcome change from 2017-2018 when 18 deaths were confirmed and then, in 2018, no births. As part of his presentation, Rittmaster also makes a point of addressing the threats facing marine mammals — such as military sonar activities, seismic testing, marine debris, fishing gear, ship strikes, and other hazards — and what can be done to counter them. “We’ve got a whole lot to lose,” he said. “But there’s something we can do about that. “And the public can be involved.” For more information on the 2019 NC Whales and Whaling Symposium or other programs and events at the NC Maritime Museum, visit ncmaritimemuseumbeaufort.com or call 252-504-7740. Beach Days While there are more than 100 access points tucked into neighborhoods along Bogue Banks, the 25-mile barrier island that runs from Fort Macon to Emerald Isle, they are generally designed for the residents who live in the area and offer limited to no parking for visitors. There are, however, a large number of public beach access points with generous parking for visitors to the area. Several of the larger sites do charge for parking during the season (generally April-September). We have noted where a charge may be incurred. The list below follows the beach from the east to west. At the end of Hwy 58, guests will find 277 free parking spaces near the fort with several beach access points on the other. Closer to Atlantic Beach, the Bath House area features 317 free parking spots, bathrooms, concessions and a boardwalk. In Atlantic Beach, this site offers 50 paid sites, bathrooms and showers. The Circle in Atlantic Beach has paid parking for 146 vehicles and the nearby bathhouse has 64, along with picnic tables and outside showers. outside showers, picnic tables and bathrooms and is located within the Roosevelt State Park area. This unpaid lot offers 36 parking spaces and a 4-wheel drive access ramp for off-season use. In the curve of the Cameron Langston Bridge, this access site offers 250 paid parking slots, picnic area, showers and bathroom facilities. Located off the island between Morehead City and Beaufort, the Radio Island access provides plenty of parking, restrooms, showers and a narrow inland beach with limited wave action. 207 W. Atlantic Blvd, Atlantic Beach. GET THE MOST FROM YOUR TIME ON THE ISLAND! A private beach and pool club with full ABC permits and a gourmet eatery conveniently located off Coast Guard Road in Emerald Isle. Barbecue is a serious topic in North Carolina and that’s certainly true in the Town with Old-Fashioned Courtesy. It is barbecue, after all, that put the small rural town of Newport on the map. As the home to what many claim is the largest whole hog cooking contest in the country, the friendly town is once again preparing to share its down home charm with the masses. Planned for April 5-6 at Community Park, the Newport Pig Cookin’ Contest will draw thousands with its amusement rides, live entertainment, vendors and abundance of Carolina barbecue. About 70 hogs are cooked annually by teams from around the country all vying for top honors. Things kick off with a parade on Friday evening and the chefs quickly get to work. Judging takes place Saturday morning and barbecue plates go on sale around 11am. To learn more visit www. newportpigcooking.com. Tryon Palace gardens will be open for free in conjunction with the New Bern Historical Society’s 2019 Heritage Homes Tour, Friday through Sunday, April 12-14 in historic downtown New Bern. Enjoy a variety of spring blooming plants, including tulips, irises and more, throughout the 16 acres of gardens of Tryon Palace during Garden Lovers’ Weekend. Visitors will have a chance to take a bit of the color home with them during the semi-annual sale. From herbs to bulbs, take some of Tryon Palace home to plant in your own garden. Gardens will be free and open to the public Friday, April 12, from 9am to 6pm; Saturday, April 13, from 9am to 6pm; and Sunday, April 14, from noon to 6pm. the Easter Bunny. No hunt is planned – but there are plenty of treats available. Bring a basket. Details: 252-354-6350. April 20: Beaufort Historic Association. 11am, free. Children age 7 and younger are welcome to join the fun at the Beaufort Historic Site for its annual Easter egg hunt. Prizes, refreshments and an abundance of eggs will be ready and waiting – and it’s all free. Be sure to bring your basket. Details: 252-728-5225. April 20: Morehead City. 9:30am, free. The Morehead City Easter Egg Hunt is held at Rotary Park on Mayberry Loop Road in Morehead City. Designed for children 12 and under, the hunt will consists of an unbelievable 10,000 eggs, as well as three grand prizes. Details: 252-726-5083. White Oak Shores Camping and RV Resort is hosting the spring White Oak Shores Bluegrass Festival on Friday and Saturday April 25-27. The campground, located at 400 Wetherington Landing Road in Stella on the White Oak River. An array of performers are expected for the event, including the Garrett Newton Band, Hwy 58, Wood Family Tradition, Telluride, Constant Change, Jonah Riddle & Carolina Express, Ted Jones and the Tarheel Boys, Po’ Rambling Boys and more. Tickets are $25 per day or $40 for both days. Guests are welcome to bring chairs, blankets and comfort items to enjoy the shows at the site’s amphitheater. Food will be available on site. For information, visit whiteoakshores.com. of the most beautiful homes and gardens in New Bern. Details: www.newbernhistorical.org. Heritage Plant Sale. Take a little piece of Tryon Palace home with you to enjoy all year long. The annual plant sale, held during Garden Lovers’ Weekend, offers a wide variety of annuals, heirloom vegetables, perennials, herbs and other favorites. Open from 9am5pm Friday and Saturday. Details: www. tryonpalace.org. pert Joanne Powell for a birding cruise on and around the White Oak River and Bogue Sound including Huggins and Bear islands, for migratory birds. The group will slowly cruise on a covered ferry boat through the estuaries. Cost is $20-$25. All ages are welcome, although the program is geared toward adults and older children. Sponsored by the NC Coastal Federation. 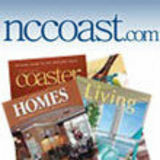 Details: 252393-8185 or www.nccoast.org. 16 & 23: Behind the Scenes – Costume Shop. 2pm. Visit the Tryon Palace Costume Shop for a discussion on historical clothing, research and sewing techniques used in the past. Cost is $6 for adults, $3 for students. Details: www.tryonpalace.org. Tue. 16: Shackleford Banks – Horses, Hiking & History. 8:30am. Experience Outer Banks history and wildlife with a guided hike on Shackleford Banks, part of Cape Lookout National Seashore, with the NC Maritime Museum. Under 18 must be accompanied by adult. Cost is $35 per person. Details: 252-504-7740 or www.ncmaritimemuseumbeaufort.com. Wed. 17: Brown Bag Gam – The History of the Museum. Noon. Pack a lunch and join the staff at the NC Maritime Museum and learn about the history of this popular museum. No reservation required. Details: www. ncmaritimemuseumbeaufort.com, 252504-7740. Race. 8am. Sponsored by the Lookout Rotary Club, this annual family-friendly event begins and ends at the Train Depot, Morehead City and includes a 1-mile, 5K, 10K and half marathon runs with awards in a variety of categories. Pre-registration is available online. Onsite registration begins at 6:30am. Details: www.lookoutrotaryroadrace.com. Crystal Coast Earth Day. 10am2pm. Local museums and organizations come together at Fort Macon State Park with displays and activities showcasing their conservation efforts. Museum. Under 18 must be accompanied by adult. Cost is $35 per person. Details: 252-504-7740 or www.ncmaritimemuseumbeaufort.com. 3, 7, 10, 14, 17, 21, 24, 28, 31: Behind the Scenes - Shark Snack. 2:30-3:30. Visit food preparation areas, animal holding areas and labs and get an overhead view of the Living Shipwreck while aquarists feed the sharks. Age 5 and up, $20. Details: 252-2474003 or www.ncaquariums.com. Fri. 3: First Friday – Civil War Medicine. 2-3pm. Gary Riggs, the military interpretive units coordinator at Tryon Palace, delves into medical practices and procedures used during the Civil War, both at home and on the battlefield. Cost is $6. Details: www.tryonpalace.org. 4-5: Bikes & Blooms. To welcome riders for the Bike the Banks events, the Emerald Isle Garden Club encourages local businesses and residents to colorfully display bicycles and blooms. Be sure to vote for your favorite. Last year, more than 30 displays were featured. 4, 11, 18, 25: Behind the Scenes: Aquarium Close Encounters. 2pm. Visit labs and holding areas, and feed the animals in this thorough behind-the-scenes adventure that includes an overhead view of the Living Shipwreck. Age 8 and up, $25. Details: 252-247-4003 or www.ncaquariums.com. Sat. 4: Wooden Boat Show. 9am-4pm. Join the NC Maritime Museum for a day full of demonstrations, lectures, races, competitions and more, all focused on some of the most elegant wooden boats still in action. While the fun takes place on the Beaufort waterfront, free parking and a shuttle is offered at the site’s Gallants Channel Annex. Details: 252-728-7317 or www. beaufortwoodenboatshow.com. Beaufort National Boatbuilding Challenge. 11am5pm. Join the fun under the big top on the Beaufort waterfront as two-man teams attempt to construct a skiff in four hours … and then take it for a spin! Construction runs through 3pm and judging is planned from 3-4pm. Entry fee is $100. Details: beaufortchallenge.com. Bike the Banks. 8am. This event offers three rides to choose from, 10 miles, 50 miles and 100 miles, all showcasing the area’s beautiful scenery. Entry fees are $25 to $40. Register at active.com. Details: mrt@ec.rr.com. Reelin’ for Research. This charity fishing tournament in Morehead City benefits UNC Children’s Hospital’s research division. Details: reelinforresearch.org. Mosquito Run/Walk. 8am. The Friends of Fort Macon organize this annual run/walk at the state park. This year’s event includes both a 5K and a 10K. Sign up at runtheeast.com. Sun. 5: Around the Island Race. 8am-Noon. This nonstop race around the islands that form Beaufort Harbor is organized by the NC Maritime Museum. Course is chosen on the day of the race based on wind and weather conditions. Begin and end at the museum’s watercraft center. Details: 252-504-7740 or www. beaufortwoodenboatshow.com. Free pickup & delivery! Call ahead or go online to reserve & ensure availability. 6, 13, 20: Story Time & Pre-K Play. 9-10am. Parents and tots 5 and under enjoy open play in the Emerald Isle Parks and Recreation gymnasium. Parents must accompany children. Free. Details: 252-354-6350. Tue. 7: Behind the Scenes – Conservation Lab. 2pm. Learn about the conservation work that is done to artifacts on exhibit at the Governor’s Palace, NC History Center and historic homes around Tryon Palace. Cost is $6 for adults, $3 for children. Details: www.tryonpalace.org. Wed. 8: Kayak the Salt Marsh. 9am-Noon. Learn about local history and the importance of sale marshes while enjoying a relaxing paddle with the NC Maritime Museum, Beaufort. Instruction and safety lessons provided. Participants must know how to swim and some kayak experience is recommended. Advance reservations required. Cost is $35 per person, $20 with own kayak. Details: 252-504-7740 or www.ncmaritimemuseumbeaufort.com. Fri. 17: Astronomy. 8pm. Meet at the bath house at Fort Macon State Park for a chance to view the night sky through a telescope. Details: 252-7263775.
bending and different methods of creating the back bone of small boats. Course fee is $135. Must be 16 to participate. Details: www.the watercraftcenter.com, 252-504-7740. 17-18: Crystal Coast Quilters’ Guild. 9am-5pm. The Crystal Coast Quilters’ Guild honors the art of quilting with a show at the Crystal Coast Civic Center. Vendors, a silent auction, exhibits, raffles and more make this a great opportunity to learn more about the craft. Details: www.crystalcoastquiltersguild.org. Beaufort Music Festival. Historic Beaufort hosts this annual music festival that features a wide genre of music. Held at the Gallant’s Channel site off, just off Highway 70. Family friendly. Details: beaufortmusicfestival.com. Sat. 18: Colonial Market. 10am4pm. Experience the excitement of a colonial market during a militia muster at Tryon Palace with historic craft demonstrations and performances by the Fife and Drum Corps. Details: www. tryonpalace.org. Outlander at Tryon Palace. Fans of the Outlander series can now follow Claire and Jamie’s footsteps in North Carolina s they visit Tryon Palace. Tours begin at 9:15am and at 4:15pm. Tickets are $15. Details: www.tryonpalace.org. AB Beach Music Festival. 11am6pm. The Town of Atlantic Beach brings a chance to shag on the shores this spring with its popular music festivals. Performers include Coastline, Band of Oz, Fantastic Shakers and the Mighty Saints of Soul. Free. concerts are free and open to the public. Lawn chairs and blankets are welcome. Details: 252-726-3775. Sat. 1: Kayak for the Warriors. 10am. This signature Pine Knoll Shores’ event sees kayakers taking to the water in support of wounded servicemen. Expect an opening reception on Friday evening with Saturday bringing kayak and paddle board races and a hot dog lunch. An awards reception follows. Details: 252-247-4353 or k4tw.org. Tue. 4: Behind the Scenes – Gardens. 2pm. Tryon Palace Gardens Manager Hadley Cheris takes guests on a tour to discover what is popping up in the gardens on site. Cost is $6 adults, $3 students. Details: www.tryonpalace.org. 6, 13, 20, 27: EmeraldFest. 6:30-8pm. Enjoy live music and a peaceful ocean breeze at the Western Ocean Regional Beach Access, Emerald Isle. Lawn chairs and blankets are suggested. Free. Details: 252-354-6350. 6 & 20: Beach Run. 6:30pm. Carteret County Parks and Recreation organizes this annual series featuring 1-mile, 5K and 10K options for all skill levels at the Atlantic Beach Circle. Cost is $7. Registration begins at 5:15pm. Register at ccpr.recdesk.com. Fri. 7: First Friday – The Importance of Pollinators. 2-3pm. Join Tryon Palace Garden and Greenhouse Manager Hadley Cheris for a discussion on the historical importance of pollinators and how the palace has designed its gardens to encourage them today. Cost is $6. Details: www.tryonpalace.org. 8, 14, 22, 28: Concert at the Fort. Friends of Fort Macon annually bring visitors to the site with its popular concert program. Daytime concerts beginning at 1pm are scheduled for June 8 (Caffeinated Soul Boogie) and June 22 (The Mad Fiddler) and evening concerts beginning at 6:30pm are slated for June 14 (Unknown Tongues) and June 28 (Telluride). Concerts are free and open to the public. Lawn chairs and blankets are welcome. Details: 252-726-3775. Sat. 8: Maritime Day. 11am-2pm. Celebrate Maritime Day with the NC Maritime Museum, Beaufort. Sail in the museum’s fleet of traditional wooden boats, cast a line with a cane pole, join in on the games or simply relax and enjoy the music and the view of Gallants Channel. Donations requested. Details: 252-5047740 or www.ncmaritimemuseumbeaufort.com. Build a Boat in a Day. 9am-4:30pm. Adult and child teams use the stitch-and-glue technique to assemble a prepared kit for a small flat-bottomed plywood boat suitable for rowing or paddling. Teams are limited to four people with at least one adult. Minimum age is 8. Cost is $600. Reservations are required. Details: www.thewatercraftcenter.com, 252-504-7740. Youth Fishing Derby. 9-11am. Free event open to kids ages 5-12. Pre-registration is required and is limited to 100 participants. Bring your own rod. Bait will be provided while supplies last. Details: 252-354-6350. Wed. 12: Shackleford Banks – Horses, Hiking & History. 8:30am. Experience Outer Banks history and wildlife with a guided hike on Shackleford Banks, part of Cape Lookout National Seashore, with the NC Maritime Museum. Under 18 must be accompanied by adult. Cost is $35 per person. Details: 252-5047740 or www.ncmaritimemuseumbeaufort.com. Summer Science School – Preschool Story Time and Crafts. 9-10am. Includes a story, estuarine critter observation and a related craft at the NC Maritime Museum, Beaufort. Free. Details: 252-504-7740 or www.ncmaritimemuseumbeaufort. com. Fri. 14: Friday Free Flicks. 7pm. At Emerald Isle Parks and Recreation on the second Friday of each month. Movies are family oriented. Popcorn and a drink are $1. Bring chairs or blankets. Realty World-First Coast Realty, 407 Atlantic Beach Cswy., Ste. 1, AB, 252-247-1000. (Map #17) With additional offices in Indian Beach and Beaufort, Realty World First Coast specializes in coastal real estate along the Crystal Coast. The right agent makes all the difference. Find yours by calling 252-247-0077, 252-728-6455 or 252247-1000 or visiting www.realtyworldfirstcoast.com. Sun-Surf Realty, 7701 Emerald Drive, EI, 252-354-2958. (Map #50) Come for a week – stay for a lifetime. Over 300 resort rentals on the Crystal Coast. Rentals, 866-829-6849, 252-354-2658; sales, 877-698-3194, 252-354-2958. View rental and sales properties at www.sun-surf.com. Capt. Stacy IV, 416 Atlantic Beach Cswy., Atlantic Beach, 252-247-7501. (Map #21) Docked at the Capt. Stacy Fishing Center on the Atlantic Beach Causeway, 83-ft. air-conditioned vessel leaves for the Gulf Stream at 6am; 24-hr. trips to the Gulf Stream, call for reservations, MC/V/DC. Island Essentials Linen & Leisure Supply Co., 208 Bogue Inlet Drive, Emerald Isle, 252-354-8887. (Map #55) High quality baby & beach gear rental equipment with free delivery & pick-up to your vacation home. Also bed & bath linen service. Visit the new showroom, 8002 Emerald Drive, by appointment only. Services available year-round, reserve ahead to ensure availability, 888-398-8887, info@island-essentials.com. Harbor Specialties, 437 Front St., Beaufort, 252-838-0059. (Map #75) Offers “nautical but nice” fine gifts & clothing. Featuring the Tilley Hat, Vera Bradley bags & accessories with complimentary monogramming, Tervis Tumblers, Dubarry deck shoes, Chelsea clocks & barometers, boat models & ready to embroider Adams Caps. Custom embroidery & logos in-house. Bring in yours, harborspecialties.com. Island Proper Outfitters, 431 Front St., Beaufort, 252-838-1576. (Map #29) Carries high quality apparel, footwear, and accessories pefect for men of all ages. Brands include Vineyard Vines, Johnnie-O, Patagonia, Faherty, Roark Revival, Howler Bros, Southern Proper, Smathers & Branson, Maui Jim, RayBan, Kaenon, Yeti, Cole Haan, Olukai and so much more! Island Proper Boutique, 431 Front St., Beaufort, 252-838-1576. (Map #71) A sweet little boutique located on the waterfront in Historic Beaufort, NC. Island Proper Boutiqe offers a wide array of apparel, footwear, and accessories for women of all ages. Featuring brands including Karlie Clothes, Escapada, Tyler Boe, BB Dakota, Barbour, Haley and the Hound, Jude Connally, Jack Rogers, Dolce Vita, Chocolat Blu, Hobo the Original, Mignonne Gavigan, Kendra Scott, Loren Hope and much more! Island Traders, 421 Front St., Beaufort, 252-504-3000; Atlantic Station, Atlantic Beach, 252-240-2825. (Map #29) The store that started it all! Find great names at great prices. Featuring Costa Del Mar, Reef Sanuk, AFTCO and Keen. Also check out the huge selection of T-shirts and accessories. Visit www. islandtraders.com. Kitty Hawk Kites, 419 Front St., Beaufort, 252-728-6670. (Map #76) Your vacation outfitter, carrying a large selection of kites, toys and apparel including Southern Tide, Salt Life, Quicksilver, Fripp & Folly, Life is Good and more. Periwinkles of Beaufort, 510 Front St., Beaufort, 252-504-2002. (Map #77) Ladies casual clothing and beachwear, perfect for vacation or every day. Brands include Escapada and Barbara Gerwit and more. Be sure to check out the jewelry, accessories and gift items. Top it Off Boutique, 8700 Emerald Plantation, Suite 7, Emerald Isle, 252354-7111. (Map #62) Experience the difference – offering unique gifts, jewelry, clothing, accessories, shoes and much more. Whimsical and fun gifts for all occasions. Emerald Isle Beach & Pool Club, 101 Dolphin Ridge Road, Emerald Isle, 252-241-5302. (Map #47) Emerald Isle’s only private beach club. Weekly and seasonal memberships available. Private beach access, swimming pool, tennis courts, shower and changing facilities, game room, full ABC permits and gourmet eatery for the convenience of members. Visit emeraldislebeachclub.com. Kites Unlimited, 1010 W. Fort Macon Road, Atlantic Beach, 252-2477011. (Map #28) Fly your own kite or watch the colors of other friendly kite fliers 10am Sundays at Fort Macon State Park, hosted by Kites Unlimited, a great place for kites, toys, gifts & more in Atlantic Station Shopping Center, kites-birdstuff.com. Full Circle Café, 708 Evans St., MHC, 252-773-0703. (Map #5) Creative cuisine using locally sourced ingredients featuring wood-oven pizza, noodle bowls, salads, small plates and daily seafood features. Open Monday-Saturday. Rucker Johns, 8700 Emerald Drive, EI, 252-354-2413. (Map #56) Located in the Emerald Plantation Shopping Center, the restaurant prepares everything in-house; great sandwiches, salads, pastas, lightly battered & barbecued shrimp, grilled seafood, steaks, chicken & more. Open daily all year for lunch & dinner, outdoor dining available. All ABC, MC/V/AE. Teacher’s Pet Where Learning Begins and the Fun Never Ends! SPECIAL EVENTS CENTER BIRTHDAY PARTIES BABY SHOWERS ART & MUSIC CLASSES THEMED EVENTS ALL YEAR AND SO MUCH MORE! Call for Information! Follow us on Facebook to learn more about our Special Events, Summer Classes, and Birthday Buckets! Whether lookingfor foraaﬁrst ﬁrsthome homeororyour yoursecond, second, Whether you’re you’re looking ourour team makes the you can team the real real estate estateprocess processeasy, easy,sosothat that you can spend more time spend time doing doingthe thethings thingsthat thatmatter mattermost. most. Experience The Today. Experience The Realty RealtyWorld-First World-FirstCoast CoastDifference Difference Today. Start a new family tradition on the Crystal Coast! Let Emerald Isle Realtyâ&#x20AC;&#x2122;s expert Vacation Planners help you find the perfect vacation rental for you and your family and let the memories begin.